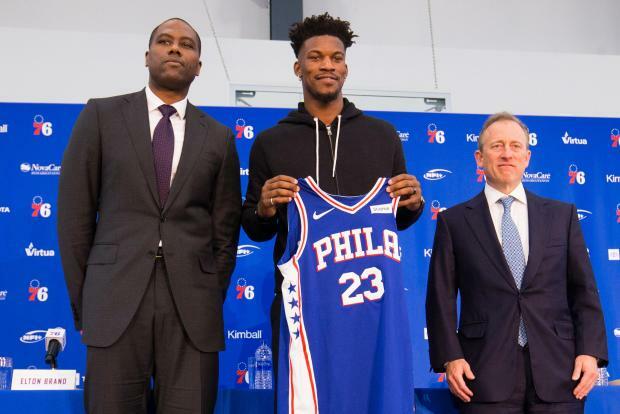 Jimmy Butler hit a buzzer-beating 3-pointer in overtime Saturday night, allowing the Philadelphia 76ers to overcome a 60-point explosion by Kemba Walker for a 122-119 victory over the host Charlotte Hornets. The point total was a career-high for Walker, a Hornets franchise record and the first of 60 or more in the NBA since James Harden dropped 60 on Orlando last January. After rallying from a late 10-point deficit in regulation, the Hornets found themselves down 119-114 with 1:14 left in overtime before Walker hit a jump shot and Jeremy Lamb converted a three-point play for a tie with 34.7 seconds to go. Willy Hernangomez then stole a Ben Simmons pass, but Butler blocked a Walker jumper, setting up his own offensive heroics. Rookie Luka Doncic hit the go-ahead hook shot with 70 seconds left, and host Dallas halted a 10-game losing streak to Golden State with a dramatic victory. Doncic scored 24 points and helped the Mavericks win their fourth straight when he gave Dallas a 109-108 lead. Dallas then got stops as Kevin Durant missed a hook shot on the next possession and a fadeaway with 23.8 seconds left, and Klay Thompson missed a baseline jumper with 10.6 seconds left. Durant led all scorers with 32 points on 11-of-22 shooting but faltered in the fourth quarter. He was 1-of-7 in the final 12 minutes as the Warriors lost for the third time in four games and also dropped consecutive games for the 11th time under coach Steve Kerr. Anthony Davis had his second consecutive 40-point game as host New Orleans held off Denver. Davis, who had 43 points one night earlier, led five Pelicans in double figures as the team won for the fifth time in its last six games. Julius Randle came off the bench to score 21 points and grab 10 rebounds, Nikola Mirotic had 20 points and 10 rebounds, Jrue Holiday overcame foul trouble to score 19 points and E'Twaun Moore added 13. Nikola Jokic had 25 points and 10 rebounds to lead the Nuggets, who lost for the fifth time in their last six games. Gary Harris scored 24, Juan Hernangomez had 20 points and 11 rebounds, Monte Morris came off the bench to add 13 and Jamal Murray scored 11. A big second quarter helped host Orlando snap Los Angeles' four-game win streak. Orlando made six 3-pointers in the second quarter and outscored the Lakers 37-22 in the period. The Magic turned what was a six-point deficit into a 62-53 halftime lead. Nikola Vucevic and D.J. Augustin both scored season-highs for the Magic. Vucevic had 36 points and 13 rebounds, and Augustin added 22 points. LeBron James did not play for the Lakers in the fourth quarter and finished the game with 22 points, seven assists and four rebounds. Donovan Mitchell scored 28 points to power visiting Utah past Boston. Mitchell also tallied six assists one night after he took some criticism for tallying zero assists against Philadelphia. The second-year guard had scored 31 points while taking 35 shots against the 76ers. Ricky Rubio added 20 points while Rudy Gobert chipped in 12 points and nine rebounds for the Jazz. Kyrie Irving scored 20 points and collected eight rebounds to lead the Celtics. Boston shot just 38.5 percent from the field against the Jazz, including 5-of-33 from 3-point range. James Harden and Chris Paul combined for 58 points and 17 assists while Clint Capela recorded a double-double as host Houston continued its torrid play with a rout of Sacramento. Harden finished with 34 points and eight assists, while Paul made 6 of 8 from 3-point range and had 24 points and nine assists as the Rockets won their fourth straight and their seventh in their last nine games. Capela posted 23 points on 11-of-14 shooting, plus 16 rebounds. Kings guard and Houston native De'Aaron Fox scored 19 points, while his backcourt mate Buddy Hield had 23 points and seven rebounds. Sacramento has dropped five of seven games following its surprising 6-3 start to the season. Fred VanVleet scored 18 points on 7-for-11 shooting in his first career start in 126 NBA games, and Toronto posted its largest road win in franchise history with a rout of Chicago. Danny Green finished with 17 points and made all seven of his shots. Serge Ibaka (16 points), Pascal Siakam (12) and Lorenzo Brown (10) also scored in double digits for the Raptors, whose 39-point margin of victory fell five points shy of their all-time high. Antonio Blakeney led the Bulls with 13 points off the bench. Jabari Parker and Justin Holiday contributed 12 points apiece for Chicago, which dropped its fourth game in a row. Paul George and Steven Adams combined for 13 points in a 17-4 flurry to open the second half as Oklahoma City pulled away for a win at Phoenix. George logged a 32-point, 11-rebound double-double, while Adams went for 26 points and 10 rebounds, helping the Thunder beat the Suns for the third time this season. TJ Warren had a team-high 23 points for the Suns, who have lost five of their last six. Danilo Gallinari scored a season-high 28 points, and Tobias Harris added 27 as Los Angeles overcame a 15-point deficit for a win at Brooklyn. The Clippers won their fourth straight. Jarrett Allen scored a career-high 24 points, but the Nets lost for the fourth time in five games. Bojan Bogdanovic picked up the slack after an injury to Victor Oladipo, scoring 22 points to lead Indiana past visiting Atlanta. The Pacers played most of the game without Oladipo, who left after only four minutes with a sore right knee. Oladipo, who had seen his streak of 20-point games end at 13 in his last start, scored only two points before departing. It was the seventh straight loss for the Hawks. Atlanta was led by Jeremy Lin with 16 points and Kent Bazemore with 13.